The Alpstein 450 Down Sleeping Bag from Vaude is a 3-seasons quilt concept-liberating simplicity, liberating comfort. 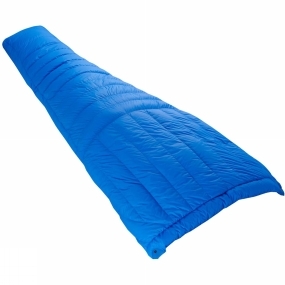 The ultra-lightweight down sleeping bag with an H-chamber construction is filled with 450 grams of high-quality 850-fill power goose down obtained in accordance with the Responsible Down Standard (RDS). Extremely lightweight, comfortable sleeping systems are possible with this quilt concept. In conjunction with your obligatory sleeping pad or air mattress, insulation at the back of the sleeping bag is superfluous-thermal insulation is provided by the sleeping pad. This not only saves weight and distributes the down fill more efficiently; it also creates more freedom of movement and comfort. Minimalists and those used to rectangular sleeping bags might forgo a hood due to weight or comfort reasons. To avoid slipping off the pad-and for more effective heat retention-the quilt can be attached to all standard pads with hi-frequency welded edges with all-purpose clips. The textile materials are certified according to the bluesign standard. The VAUDE Green Shape label stands for environmentally friendly, functional products made from sustainable materials.